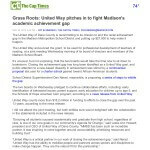 The United Way of Dane County is recommitting to its mission to end the racial achievement gap in the Madison Metropolitan School District and putting up $27,000 to help make it happen. Want to be kept up to date on what your dollars are doing? Don’t want to miss that next awesome event? Sign up for our monthly General Newsletter today! © 2019 United Way of Dane County. All rights reserved.